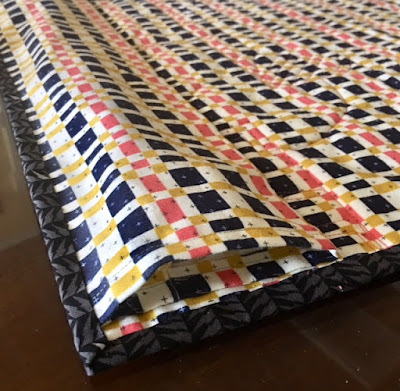 I've chosen to share the mini that I made as part of the 2018 QuiltCon swap and am calling it "Bolted" for Bloggers Quilt Festival, 2018 Fall Edition. 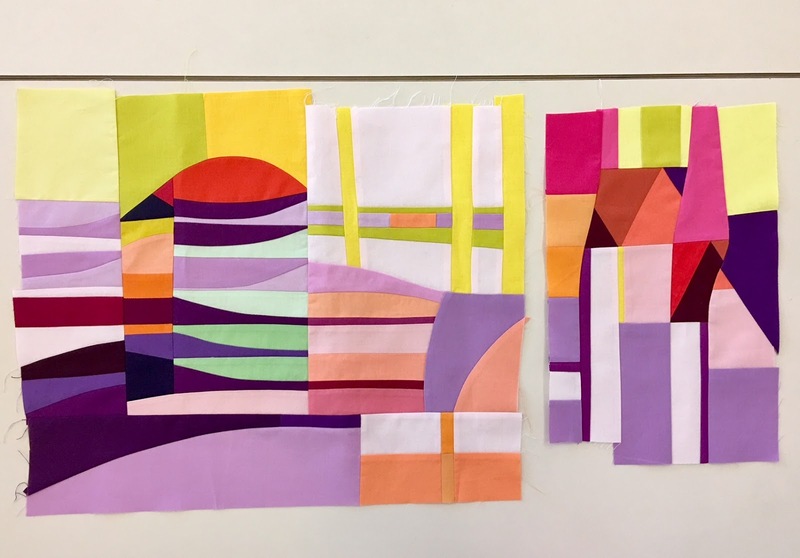 There's a QuiltCon Recap post where I mention it briefly but I think it deserves more attention than that! Creating an original design for a partner that reflects what I think they will like as well as my own style is a challenge that I very much enjoy. 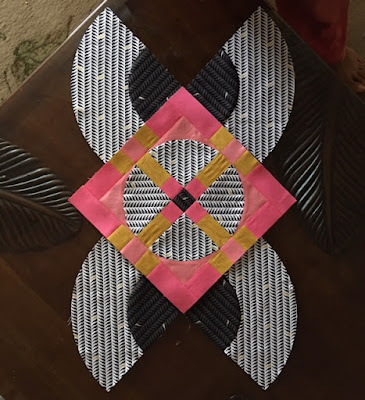 Being paired for a direct exchange rather than secret and having the opportunity to hand off in real life at QuiltCon made the swap especially fun. This is the blurry sneak that I posted on Instagram as a teaser ahead of time. Depending upon my mood, I will often snap pictures along the way as I go. The ditched design above made me laugh because it reminded me of a frog with its legs sprawled out. I do like the center set on point even if I didn't go that route it's something I may revisit. The most challenging construction was setting in the upper corner to the mitered portion. The bolts fabric reads so differently in the two color ways, I just love it. 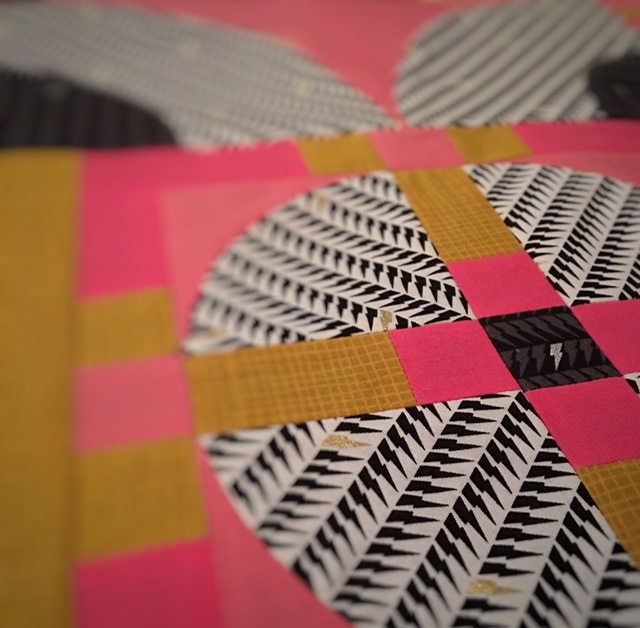 I took a lot of thought and care in making the most of the graphic print and varied shades of pink and yellow. Playing with hard and soft as well as directing the eye with directional fabric was very satisfying. There are endless possibilities and it's easy to get caught up when you design as you go, but I did have a deadline and that was a good thing to keep me from over thinking things. 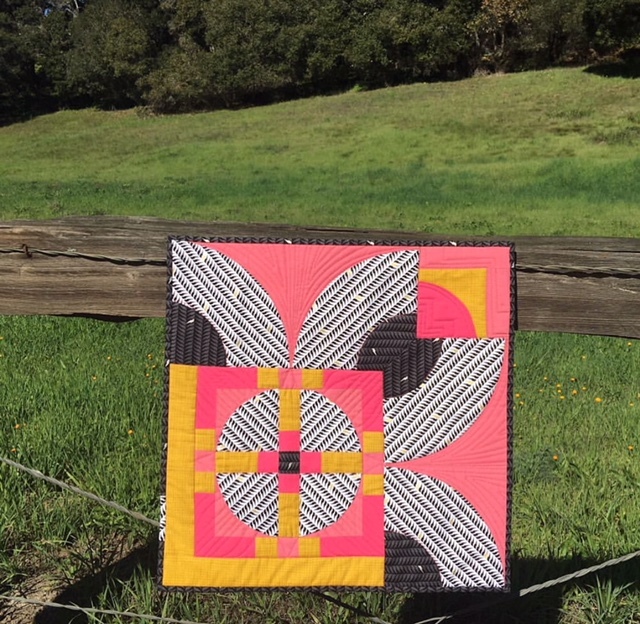 For the quilting, I went with organic improv on my domestic. The binding was fussy cut and I matched the hang sleeve print. I'm glad that Alex liked it and am so thrilled with the mini that she made for me. This was her first time attending QuiltCon and came all the way from Germany. Thank you Amy for another great festival and opportunity to discover new bloggers and to all of the generous sponsors too! September's BeeSewcial prompt for Anne was HOME and she provided a gorgeous palette and asked that we personally symbolize our interpretation. Choosing one of the most iconic scenes: The sunrise over the Santa Cruz municipal wharf as viewed from the Dream Inn hotel balcony. The blocks ended up quite pastel but I wanted to capture the subtle color changes that happen right before your eyes. Other design elements that I focused on were the contrast of horizontal and vertical (land/water, pillars/piling etc) were key and I also tried to infuse bit of the California woodcut artists influence that I admire. This was my first time staying at the hotel and I must say, listening to the bark of the sea lions while drifting off to sleep was pretty spectacular. Fun facts about the wharf: built in 1914, it is the longest pier on the west coast and visited by 1.5 million annually. No wonder traffic is challenging! An improv take on a house block as a nod to the fact that many homes were built as vacation cottages back when it was a sleepy little town people would escape to in the summer. One of my favorite quilting phrases immediately came to mind: Embrace the imperfections. Aim for structurally sound. The unplanned pencil portion is a nod to (not) drafting blueprints. I chose the Bay Area Rapid Transit map for July’s Subway prompt, focusing on 3 of the lines including the only one I’ve ridden on from Fremont to San Francisco. Many people ride the subway early in life but I was a grown up the first time I did. Despite that, I remember being just a little freaked out about traveling at a high speed not only underground but underwater. The Transbay Tube rail tunnel is a pretty unique thing to have available and I really should take advantage and plan a trip to the city. Minimalism is something that I push myself to explore with the bee blocks and I decided to eliminate the bottom portion of my sketch. The final design reminded me of a seat or even a body seated in a very modern art sort of way. Considering the subject matter and that when I do go to San Francisco it is to visit museums, this felt very complete in concept. Although the thin lines could have been done with bias tape appliqué I chose to machine piece. 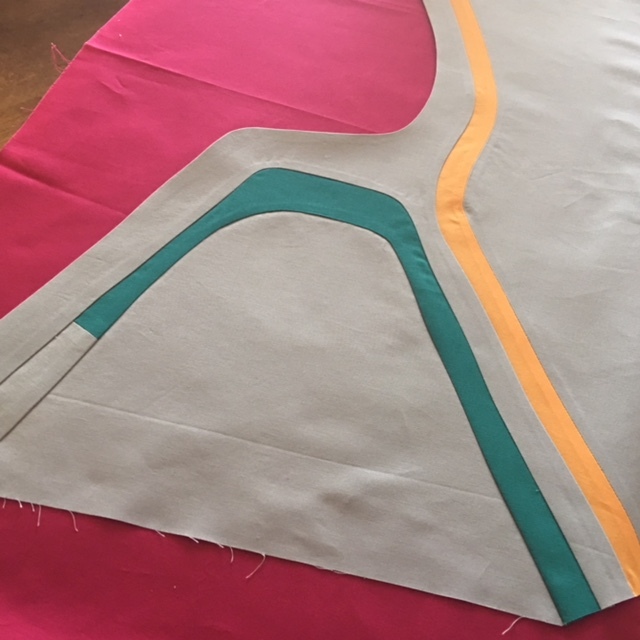 The technique of scissor and rotary ruler-free cut until the final square up suits me fine. I'm excited to have these blocks mailed off to my bee mates and can't wait to see them all together in a quilt. Linking up to Bolt to Beauty "Brag about your Beauty" with my finishes.